Neurological assessment: Head circumference, funduscopic exam, neurologic exam including all cranial nerves should be obtained. Cardiovascular examination: Auscultation for bruits on head and neck should be done. A cardiopulmonary exam should be performed, especially in neonates. Ophthalmological consultation if indicated: In patients with carotid-cavernous fistulas, an ophthalmology consult should be made to evaluate visual loss and intraocular pressure. Standard screening in preparation for contrast studies: Complete blood count, basic metabolic panel, and coagulation studies should be obtained in all patients that are undergoing angiography. Coagulation studies in preparation for surgery: A complete coagulation study should be requested to rule out hypercoagulation disorders. In addition, hypercoagulable states should be ruled out. Head ultrasound: In neonates, transfontanelar ultrasound can sometimes depict the vascular lesion. Cardiac ultrasound: In case of heart failure, cardiac ultrasound will be requested. Chest x-ray might show cardiomegaly. Hydrocephalus: Enlarged ventricular spaces generally due to venous hypertension. Vascular prominence: These are better seen in CTA and CTV, and with reformatting in different planes. Infarction: Hypodensities in vascular territories that might not necessarily follow arterial patterns and might be secondary to venous infarcts. Calcifications: Chronic venous hypertension can produce calcifications seen as hyperdensities. Edema: T2 and FLAIR sequences are the best sequences to show edema. Infarction: DWI for acute ischemia and FLAIR are good to depict chronic ischemia. Calcifications: Can adopt different appearances in different sequences. Abnormal vessels: Hypertrophied feeders, varices and dilated veins can be seen on MRI. MRA can frequently be used to better image these pathologies. Time-resolved imaging of contrast kinetics (TRICKS) sequences: These can be very helpful in identifying the site and type of DAVF(7,17). This is a very appealing non-invasive option in children. Perfusion MRI: Perfusion MRI can be ordered when available to assess perfusion abnormalities and elucidate arteriovenous shunting (arterial spin labeling [ASL] sequence). 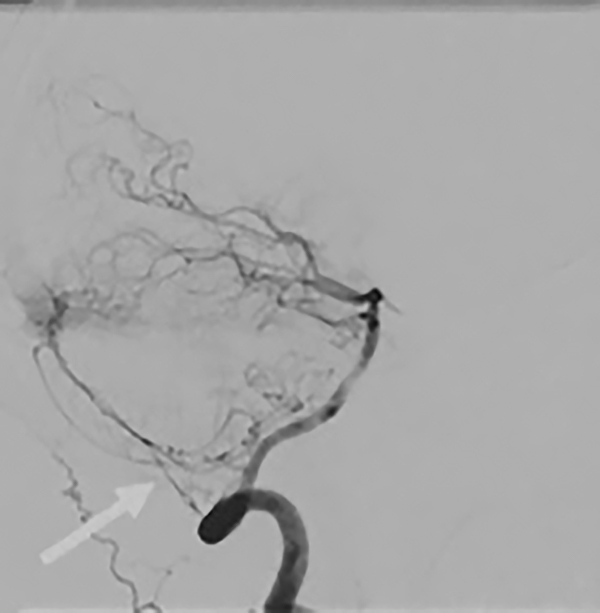 Diagnostic procedure of choice: Angiography is the most important DAVF diagnosis tool. 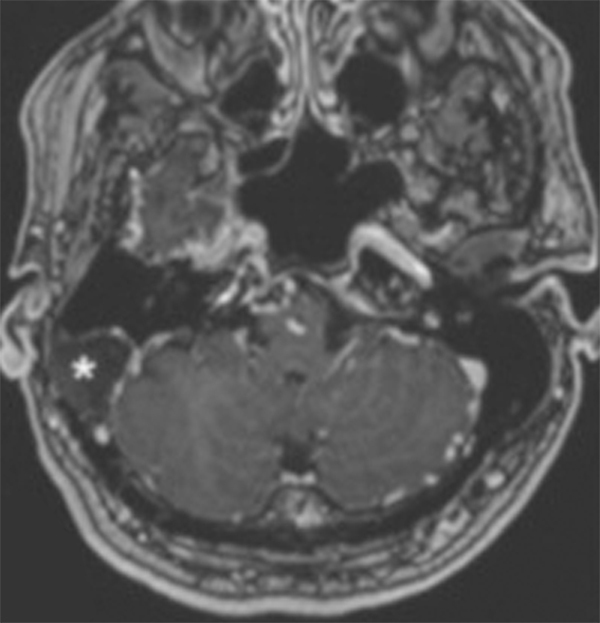 This study shows the connection, generally from the extracranial circulation, with venous sinuses and/or subarachnoid veins. 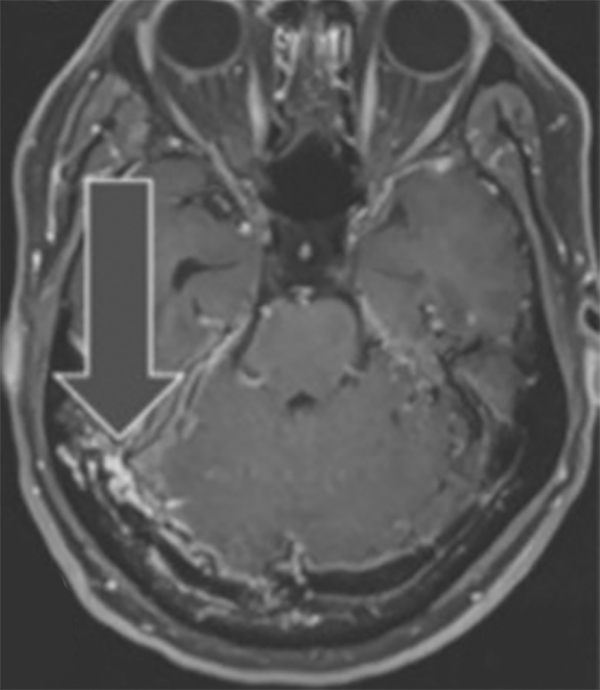 Intracranial branches might also be involved, although less frequently. It is essential to rule out the presence of cortical venous reflux and intracranial varices, which correlate with the risk of clinical manifestation. 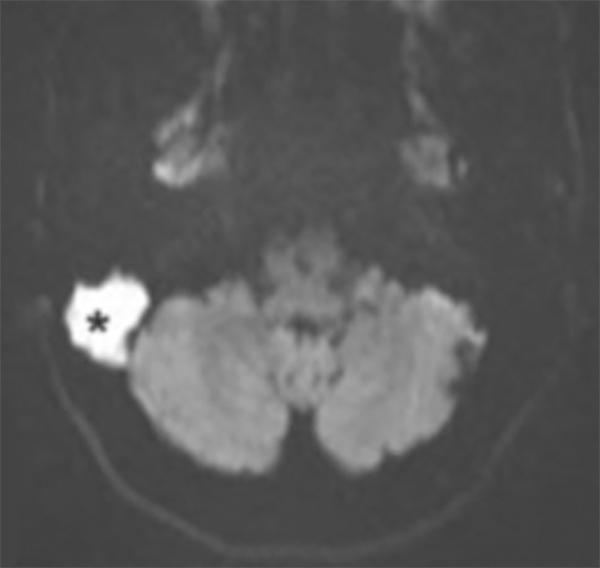 Borden Type II Dural Fistual, arterial phase right ICA Injection: Arrow points at the fistula point from the artery of Bernasconi and Cassinari to the right transverse sinus. 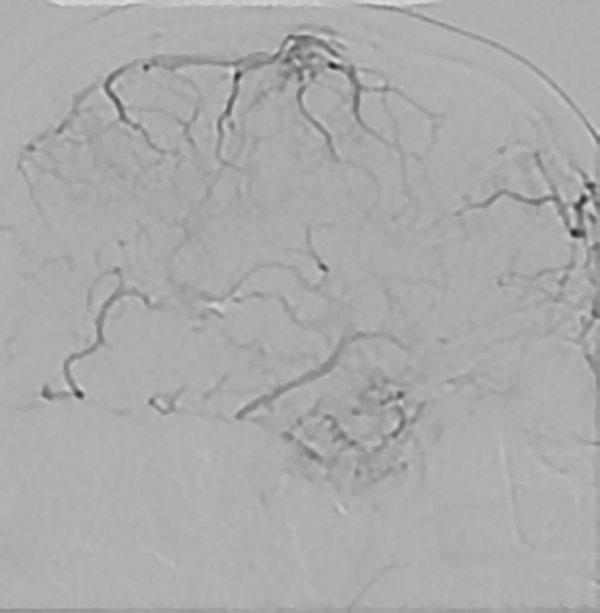 Borden Type II Dural Fistual, venous phase right ICA Injection: Venous outflow is obstructed through the sagittal sinus and occurs through large dilated cortical veins mainly through Trolard, Labbe and large frontal veins. 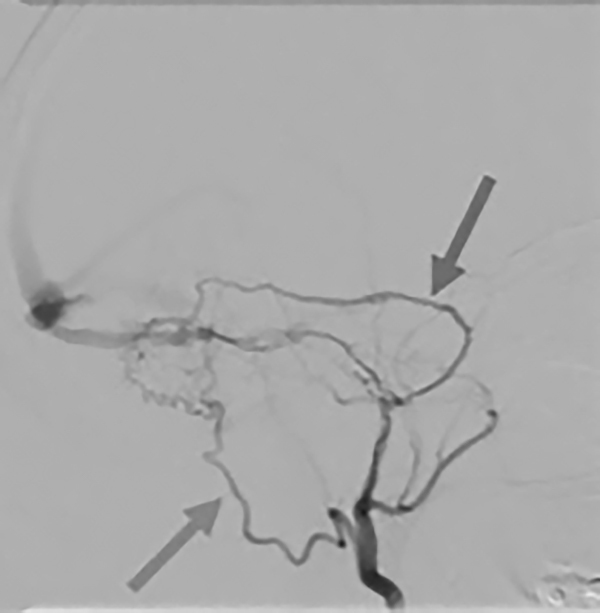 Borden Type II dural arteriovenous fistula, right external carotid injection: Several feeders from the right external carotid circulation to the fistula are demonstrated. Right occipital and distal branches of the middle meningeal artery are feeding the nidus. Distal branches from superficial temporal artery are also involved. 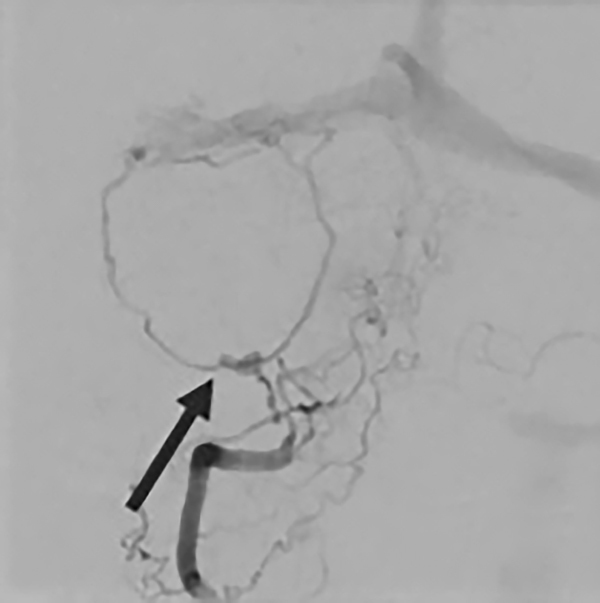 Borden Type II dural arteriovenous fistula, right external carotid injection: The arrow indicates the large dilated and tortuous left occipital artery contributing to the fistula. Borden Type II dural arteriovenous fistula, right right vertebral artery injection: The posterior meningeal artery feeder from the right vertebral artery is shown. 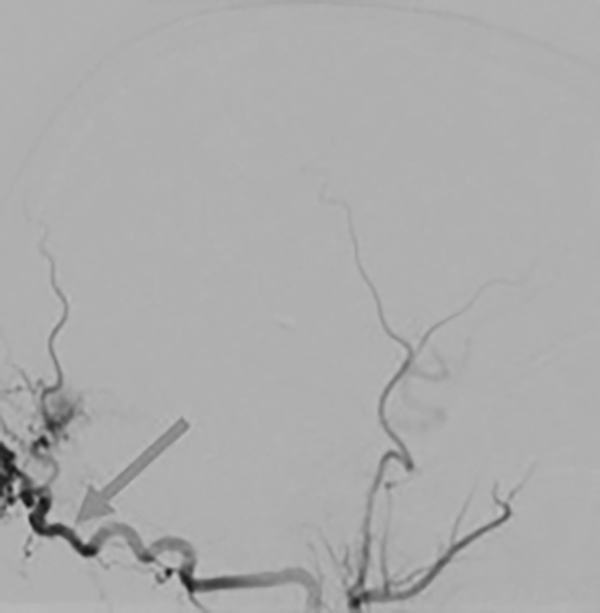 At the level of the bifurcation of the vertebral artery, irregularities of the vessel wall consistent with aneurysms are noted. 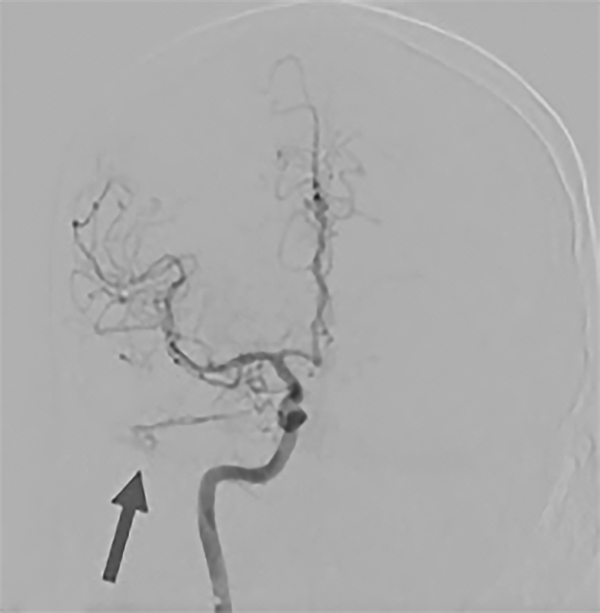 Borden Type II dural arteriovenous fistula, left vertebral artery injection: The posterior meningeal artery feeder from the left vertebral artery is involved. Carotid and aortic arch: Selective studies of internal and external carotid, bilateral subclavian and vertebral arteries should always be performed. EEG monitoring: Might be indicated in cases of seizure presentation or when having difficulties controlling the seizures. Non-emergent cases: Neuropsychological testing might be valuable, especially in older children with subtle chronic symptoms or when brain parenchyma involvement is observed on imaging. 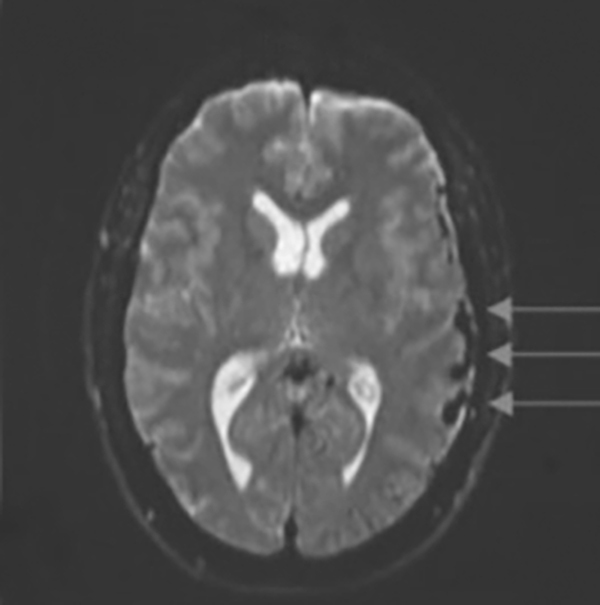 Clinical examination and imaging: Symptomatic children, those presenting with hemorrhage, cardiac failure, neurologic symptoms related to venous hypertension, or disabling bruits; or those with concerning angiographic features, such as cortical venous drainage, should be considered candidates for treatment.